This is not the first time that Antoinette and I have been on the same food page... a few weeks ago we both wanted comfort food... here and here... now we are both craving fresh, clean, lemony flavors. 'Twas the season to overindulge and 'tis the season to get back to reality! This is a rip-off meal - my take on a chicken dish at a local Italian restaurant that is so delicious I could eat it every day. I had to find an at-home solution to avoid going broke. 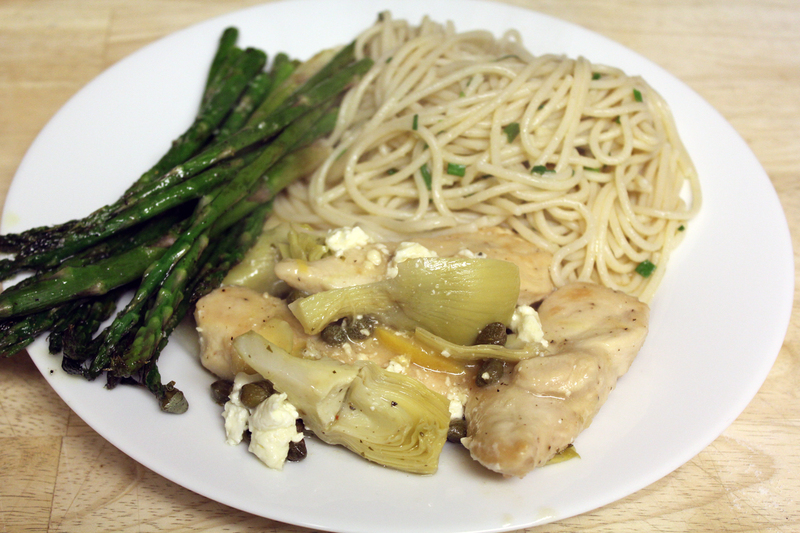 They call it Chicken Stephano, so to us, this is Chicken Stephano McIver, and it's one of our faves. In a shallow bowl or on a dinner plate combine flour, salt and pepper. 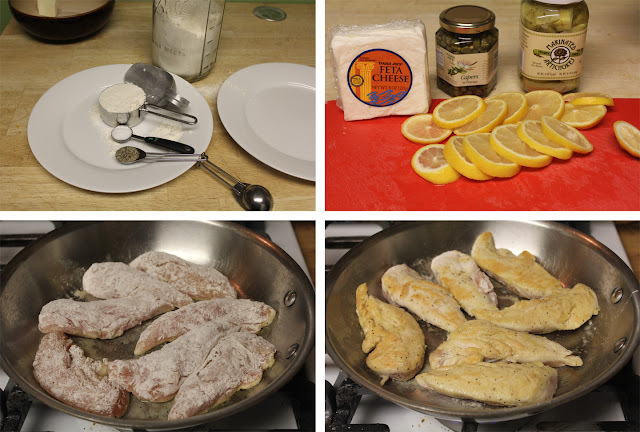 Dredge chicken tenders and set aside on a clean plate. 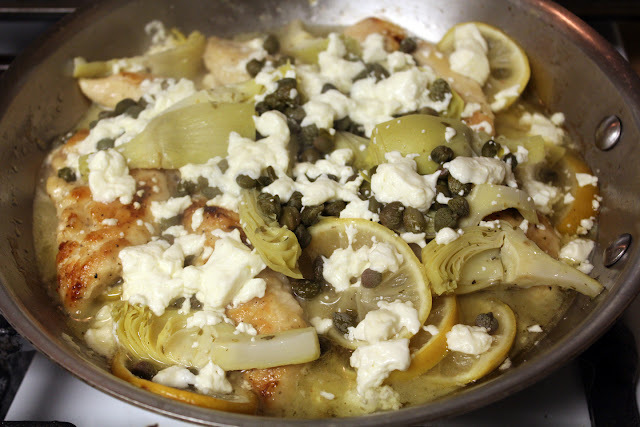 Over medium-high flame heat olive oil in a saute pan or dutch oven that has a lid. Lightly brown chicken on both sides, about 2 minutes per side. 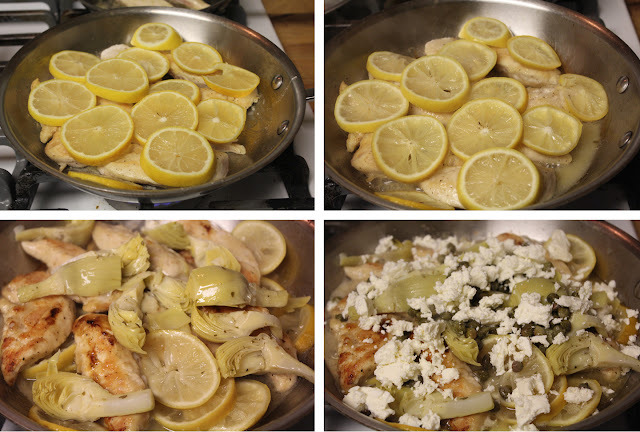 When chicken is browned on both sides, cover cutlets with sliced lemons. Reduce the heat to low and cover the dish. Cook for 10-12 minutes. Add in marinated artichokes and the liquid they are packed in. (I found a large jar at Trader Joes and used only some of the liquid. I usually buy the smaller jars and use all of the liquid.) Cover and continue to cook for 3 more minutes. Add in capers and feta cheese, cover and cook 3 more minutes or until the cheese has melted a bit. We like to eat this with butter and oil pasta. Ok, I understand this kind of negates the "fresh and clean" aspects of this meal, but it's seriously good and that's how Nona's does it. And people, Nona's is right. Cook pasta according to package directions. Drain and while pasta is hot, toss with butter, olive oil, garlic and minced chives. 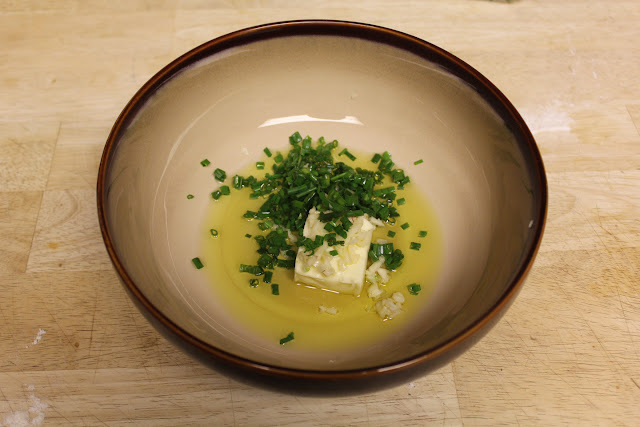 The hot pasta will melt the butter and bring out all of the garlic flavors. Amazing. Simple. Nona's throws in some crispy pancetta. Delicious. Bacon also works in a lovely way. The cutlets cook for a long time on very low heat, so they are really forgiving... 10-12 minutes can easily become 15-18 minutes if you find yourself caught up making a salad. The pasta is delicious with a little bit of red pepper flakes instead of chives. Make sure you get some of the lemony sauce on the pasta... it's wonderful. Don't eat the melted lemons. Promise, it's not good. Made this last night. Delicious! I added some chopped onions just before the chicken and nestled the chicken in it, then didn't add chives to the pasta. (only because I did not have chives/ scallions in the house.) Turned out fantastic. Having leftovers for lunch today. The kids and I LOVE this one!! This has become a staple in our house...it's Yummy, simple, fresh, and easy to make on a week night. Thank you for sharing your love of food with us. I'm SO glad you guys all liked it!! And, great to know your kids liked it too - that's always a plus. xxoo! !